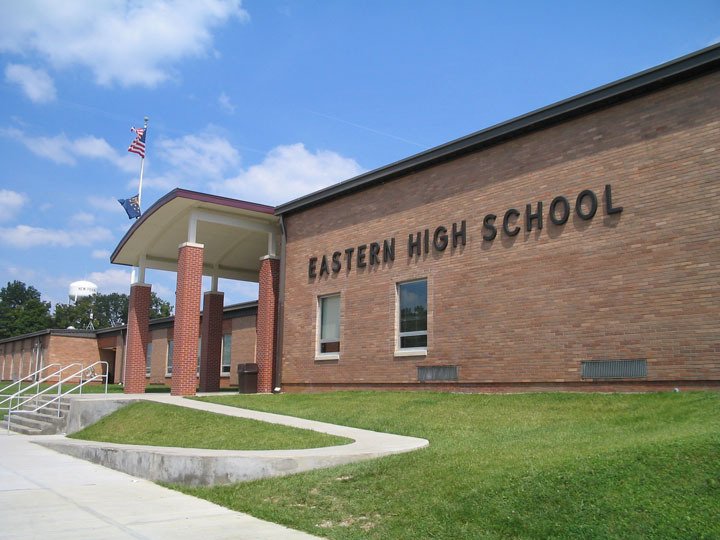 The East Washington School Corporation is located in a rural area near the small town of Pekin, Indiana, population 1,334 (2000, U.S. Census). The corporation is comprised of one elementary school (K-4), one middle school (5-8), and one high school (9-12). The East Washington School Corporation consists of four townships, Franklin, Pierce, Polk, and Jackson, all located in the southeast corner of Washington County. It is a relatively east 25-35 minute drive to Jeffersonville and New Albany, Indiana and Louisville, Kentucky. Thus, many of the residents work in the Louisville metropolitan area. The student population continues to increase. LISTEN TO THE GAME ONLINE!